If there’s one thing that we all know, it’s that home remodeling is not a one-person job! As we have mentioned many times before, the Medford Team is beyond grateful for all of our fantastic trade professionals, vendors, and suppliers that work with us on a regular basis. It would not be possible to complete our high-quality projects without them! Many of these individuals have worked with us for over 20 years and have developed trusted relationships and meaningful friendships with each of us. As a luxury remodeler, we require those that work with us to maintain a high level of pride in what they do; we wholeheartedly believe that the qualities of our final products are directly related to the individuals we choose to work with, so when we say we have a GREAT team, we mean it! To show our appreciation, we have decided to dedicate one of our weekly blogs each month to feature one of our wonderful vendor representatives. This month, the spotlight is on Jim English at Texas Appliance! We have worked with Texas Appliance in Arlington for years; starting with the location on W. Pioneer Parkway, and now the location on E I-20. They have been a great vendor, offering a large selection of kitchen, laundry, and outdoor appliances. Typically, our process includes meeting with our clients to review their designs, discuss their project and budget, and determine what appliances they need to select for their project. The clients then meet with Jim at Texas Appliance to view floor models and discuss features and options. Having Jim there to answer their questions and guide them to the best decision for their needs is invaluable to us! Jim has been a retail sales associate with Texas Appliance since June of 2000, so his knowledge of current appliances, big brands, product features, model warranties, and promotional offers is unmatched. The peace of mind and confidence Jim provides to our clients is a tremendous asset to our process. Appliance selection is a critical step in the outcome of the project as well as the happiness of the client long-term. After all, what good is a remodeled kitchen if you can’t use it?! With functionality and longevity in mind, you can be sure Jim will steer you in the right direction when it comes to appliances. 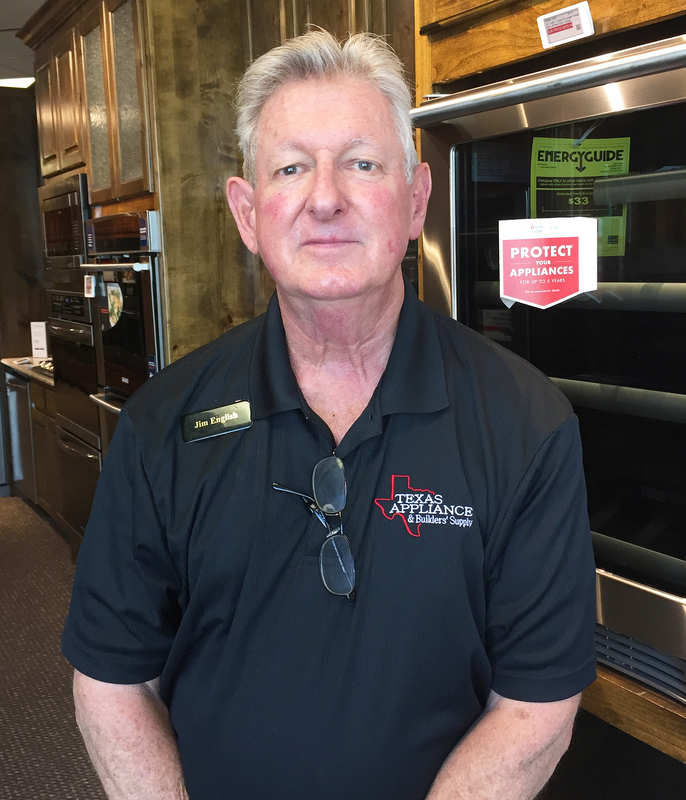 If you are planning to remodel your home with Medford Design-Build, or if you’re overdue for a new fridge, oven, washer, dryer, or another appliance – we highly recommend going to see Jim at Texas Appliance in Arlington. For the best experience, know what size appliances you need, any brands you prefer, and of course, any recommendations from your designer. Jim has told us that it is very rewarding for him to be included in the process, so you can rest assured that you’ll be in good hands! Be sure to contact us if you need help planning or designing your home remodeling project. We’ve got Jim and tons of other talented professionals that would love to help bring your dream home to life!